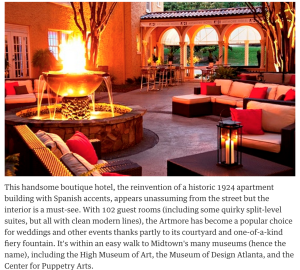 The Artmore received press from the prestigious Guardian UK, a major newspaper in The United Kingdom in an article about where to stay in Atlanta. The Artmore was listed second and featured its signature water/fire pit in its courtyard. his handsome boutique hotel, the reinvention of a historic 1924 apartment building with Spanish accents, appears unassuming from the street but the interior is a must-see. With 102 guest rooms (including some quirky split-level suites, but all with clean modern lines), the Artmore has become a popular choice for weddings and other events thanks partly to its courtyard and one-of-a-kind fiery fountain. It’s within an easy walk to Midtown’s many museums (hence the name), including the High Museum of Art, the Museum of Design Atlanta, and the Center for Puppetry Arts.